The Coloring Book Project, 2nd Edition: A Collection by 185 Artists From Around The World est le grand livre que vous voulez. Ce beau livre est créé par . En fait, le livre a 400 pages. The The Coloring Book Project, 2nd Edition: A Collection by 185 Artists From Around The World est libéré par la fabrication de Memento Publishing. Vous pouvez consulter en ligne avec The Coloring Book Project, 2nd Edition: A Collection by 185 Artists From Around The World étape facile. Toutefois, si vous désirez garder pour ordinateur portable, vous pouvez The Coloring Book Project, 2nd Edition: A Collection by 185 Artists From Around The World sauver maintenant. The Coloring Book Project, 2nd Edition: A Collection by 185 Artists From Around The World. Now Available! We would like to welcome artists of all ages to add your own creativity to the pages found within The Coloring Book Project: 2nd Edition! 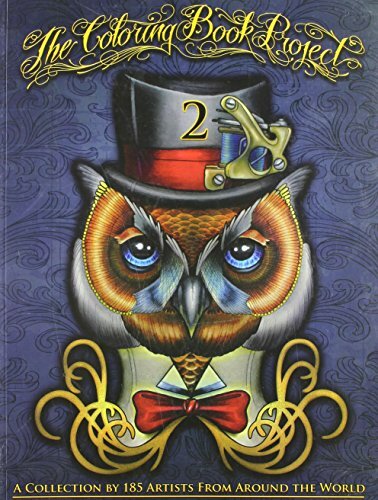 The second installment of this wonderful book brings together inspiration and cleverness from an outstanding cast of artists. They have contributed their own amazing drawing, giving you the freedom to bring them to life with your own artistic vision. With 400 pages of captivating designs to color and activities to execute, artists can delve into the pages full of inspiring artwork, and break away into an imaginative world. Softcover Book 400 Pages! 8.5 X 11 Published by Memento Publishing A portion of the contributing artists are Greg "Craola" Simkins, Jeff Ensminger, Josh Duffy, Roman Abrego, Justin Hartman, Timothy Boor, Mike DeVries, Mario Rosenau, Cory Norris, Brett Herman, Mike De Masi, Durb Morrison, Don McDonald, Jason Stephan, Sung Song, Steve Morris, Katelyn Crane, London Reese, Monte Agee, Alvin Chong, Frank La Natra, Gary Dunn, Liz Cook, Nick Mitchell, Teniele Sadd, Tim Mcevoy, Nathan Ota and many more!